Enriching tradition and culture into the lives of our people through Jewish drumming, prayer and movement. Drumming helps balance your left and right brain hemispheres, creating feelings of well-being and a powerful sense of calmness within. Research shows us that children (and adults), who partake in drumming learn better, feel happier and are more grounded. 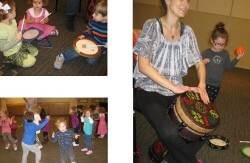 Drumming is a perfect activity to help a child focus and have fun, while learning about their Jewish heritage! During this special program, children will be introduced to the Prophetess Miriam through stories, pictures, her drum, Jewish songs and movement. Who was she? Why is she so important to the Jewish people ? We will re-create a “Biblio -drama” of the Passover story and reflect upon the story of our beloved Prophetess Miriam. We will celebrate Miriam’s victory as she led the Israelites through the pivotal moment of the splitting of the Red Sea. 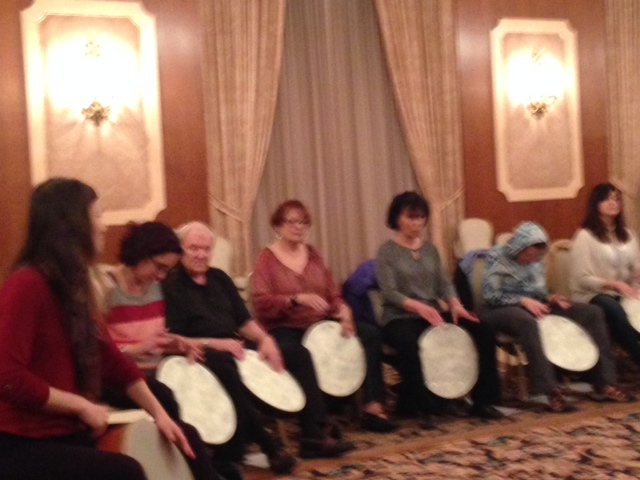 During this program, Marla creates a program that includes drumming, singing and dancing, with a focus on an upcoming Jewish holiday. She has a hands-on ORFF style of teaching, through rhythm games, body percussion, vocalization and call–response drumming. Marla also works with the Cantor to get a list of relevant songs to sing with the children. 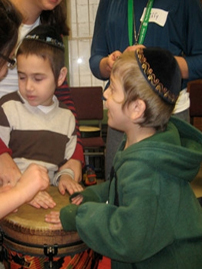 The program culminates in the children being able to drum, sing Jewish songs and dance at the same time! These are 6-8 session programs, scheduled weekly or ever other week. It is highly suggested that the program culminates with a performance of the song that they have been learning at a special concert which seems to motivate the students to learn more! Drums are provided, or can be purchased for the school at discount rates. We will use a mixture of Djembe and Tof Miriam drums, bells and shakers. The Bible tells us that the Prophetess Miriam played the Tof Drum ~ it was a important instrument for the Jewish people, used during times of prayer, celebration and joy. During this program, we will talk about Miriam and what she represents to the Jewish people. 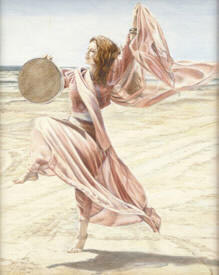 We will learn traditional Middle Eastern rhythms that are commonly used in Jewish prayers. Students will explore singing appropriate Jewish holiday prayers and nigunim, while accompanying themselves playing the Tof Miriam drum. Students will also be encouraged to compose their own melodies, with an option to record or make videos to share their new composition with their family. Some participants have been so inspired by this, that they used the Tof Miriam drum to accompany themselves singing at their Bar/Bat Mitzvah. These are 6-8 session programs, scheduled weekly or ever other week. It is highly suggested that this program culminate with a performance of the song that they have been learning at a special concert which seems to motivate the students to learn more! 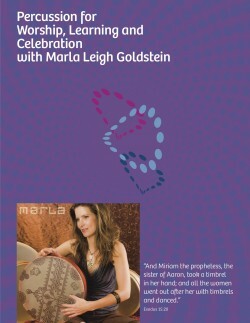 Marla offers special pre-Shabbos and Havdalah drum circles – a memorable and fun way to welcome in these special times – filled with kavanah, song and prayer..
Fun for the WHOLE Family! (kids of all ages welcome). Drums may be provided for the whole congregation. Logo’d drums (with your Synagogues name) may also be avaialbe. – A Hands-One Jewish Drumming Experience – Workshop includes: learning basic playing techniques for the Tof Miriam, how to play commonly used rhythms in contemporary Jewish music, singing Hebrew prayers while drumming, how to play in sold time, improvising and much more! Participants will also sing and play percussion instruments along with nigguns, Sephardic, and Ashkenazi Jewish melodies. This program is open to participants with NO musical experience. (made with 100% organic and Kosher ingredients). Uplifting, inspiring, bonding, rooted in Jewish tradition, wellness and SIMCH – in a safe, FUN and nurturing environment! Bring Marla to YOUR community!